20131122 - Up and into work, had my favorite meal (#171) for Fiesta Friday lunch! Home and ate with the fam, L took D to church to meet up with the Scouts at 6. J&I changed, packed and headed to the campsite. We got our tent up in the dark and ready for a cold night. When the scouts showed up D directed his patrol, and J&I helped the Old Crows get the pavilion set up. 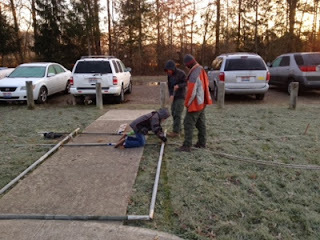 J then went with a senior scout and got a lesson in lashing and helped build the entrance to camp. IT was really cool.